This is a rather large tree fern coming from the cool mountain forests of New Zealand, especially the South Island, as well as the Subantarctic Auckland Islands. It has a very beautiful habit with its broad, soft fronds; and the stipes have dark scales and a yellow midrib. 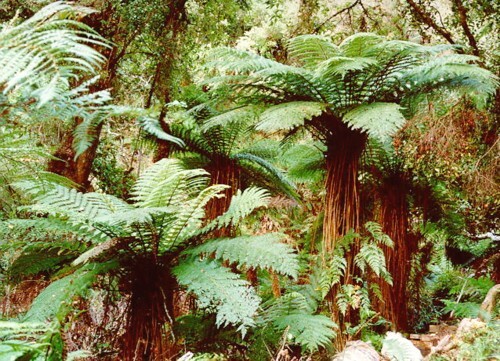 Rather than uncurling in the manner of most tree ferns, in which the main frond stalk unrolls almost to its full length before the "frondlets" (pinnae) unroll; the fronds tend to expand all at once up the length of the frond. The fronds often leave a skirt around the slender, fibrous trunk after they have died, which allows other ferns and epiphytes to grow on the lower parts of the trunk. The stipes hanging over the trunk are very characteristic of this species and make it easy to indentify among other New Zealand species. 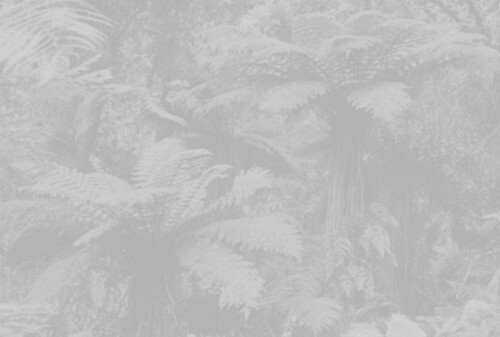 This is one of the cold-hardiest of New Zealand's tree ferns. Though it remains largely untested in cultivation, it may be able to withstand temperatures down in the range of 15-20° F. Interestingly, it does not even seem fully hardy in its native region, and in fact during the once-in-a-century freeze of July 1996, about 50-75% of plants growing in the coldest parts of their homeland were killed. Perhaps the hardiest treeferns of this species will come from spore of treeferns that survived this devastating freeze. Also, C. smithii, like C. australis and C. dregei, usually loses its fronds by the end of winter, suggesting that frond protection is not important for this species as long as the crown survives. Although it is said to be rather fast-growing, I am not optomistic for its widespread cultivation because it does not seem to be tolerant of much heat. 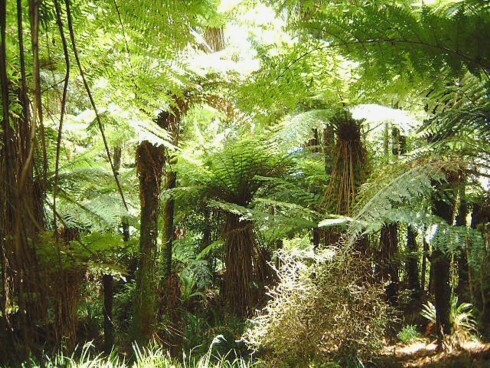 It is said to be unsuccessful on the warmer parts of New Zealand's North Island, and it does not seem to be in cultivation much in Australia. However, it is likely to do well in England, where unfortunately most plants sold as C. smithii are not, and it may be satisfactory in the Pacific Northwest, if attention is given to place it in a cool site sheltered from wind. 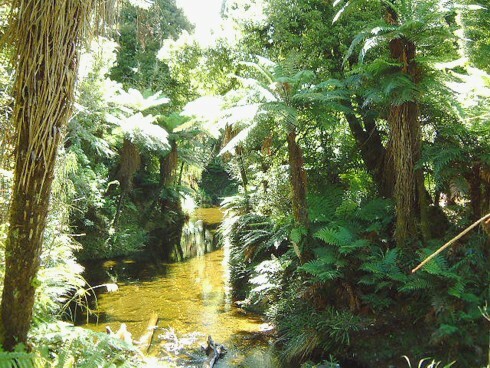 It is much less happy in exposed sunny situations than other New Zealand tree ferns and should be given a forest-like setting. Imported specimens transplant relatively easily for a Cyathea, establishing quickly. It should also be kept continually moist, as it is likely to have a very low tolerance for dryness. 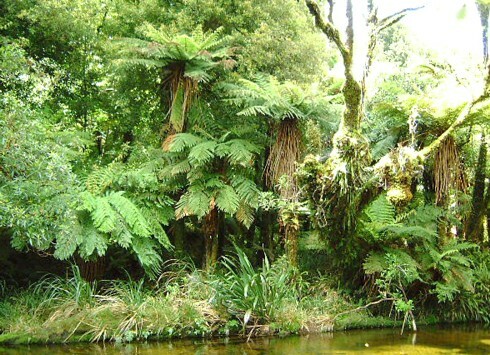 Cyathea smithii in habitat in New Zealand. Photo courtesy of Peter Richardson. 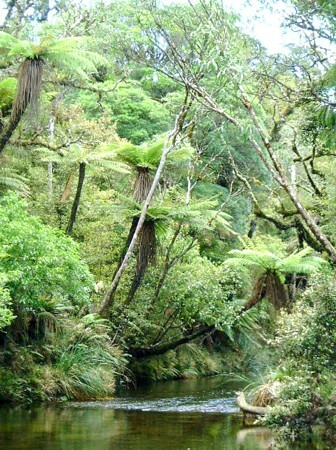 Cyathea smithii in habitat near MacLean Falls in the Catlins. This range on New Zealand's South Island is one of the coldest areas C. smithii can be found. Notice the epiphytic ferns growing on the trunk. Photo courtesy of Peter Richardson. 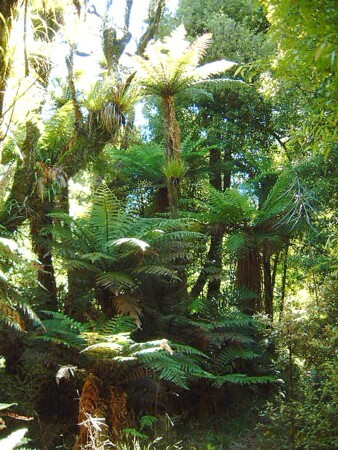 Cyathea smithii in habitat on the North Island, where it is only found in cool, shaded gullies. Photo courtesy of Peter Richardson. Crowns and skirts of Cyathea smithii. Photo courtesy of Peter Richardson. Cyathea smithii trunks leaning across a stream. Photo courtesy of Peter Richardson.